Renault's Wind resembles its sibling, the Twingo. 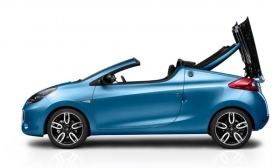 MUNICH – Renault will unveil a new roadster called the Wind at the Geneva auto show on March 2. The Wind will compete against cars such as the Peugeot 207 CC when it goes on sale in Europe in the summer. 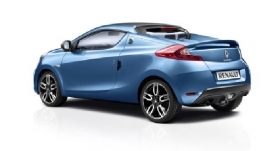 The two-seater has a hardtop electric roof that opens in just 12 seconds. Unlike most retractable hardtop roofs, which use a hinge system, the Wind's system uses a central pivot, similar to the system on the Ferrari 575 Superamerica. 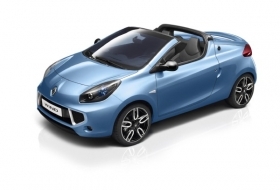 Renault says this means the Wind is the only car of its class to provide the same 270 liters of luggage space whatever the position of the roof. The Wind's pivoting roof offers generous luggage space. The Wind is based on the same platform as the Twingo hatchback but is about 200mm longer at 3830mm. The Wind will compete against the Peugeot 207 CC. According to the company, it is aimed at motorists who "lust after a car that is not only distinctive and compact, but also convertible yet practical enough for everyday use."